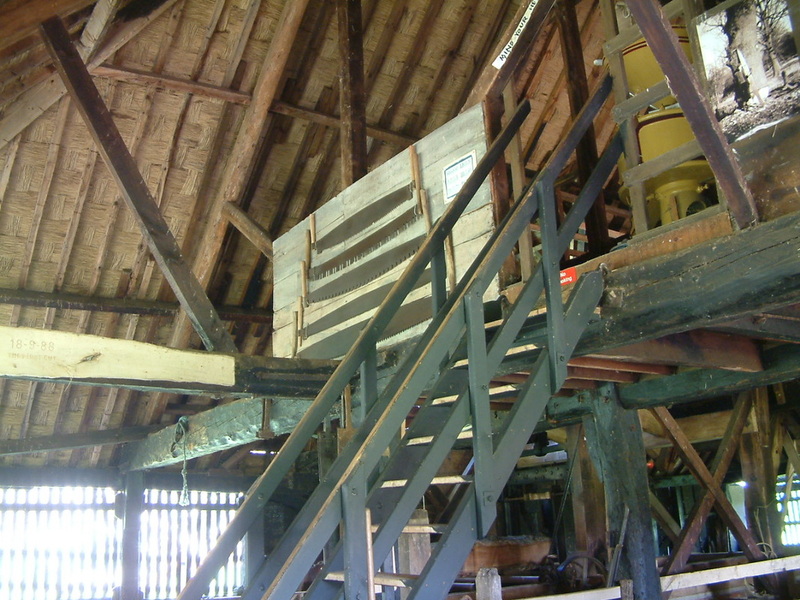 The Mill As a Group Venue. Recently we have welcomed the Norfolk Austin Seven Club who had one of their runs coincide with the open day at the Mill and a special opening for the Panther Owners Club many members turning up riding motorcycles that gave the group its name. 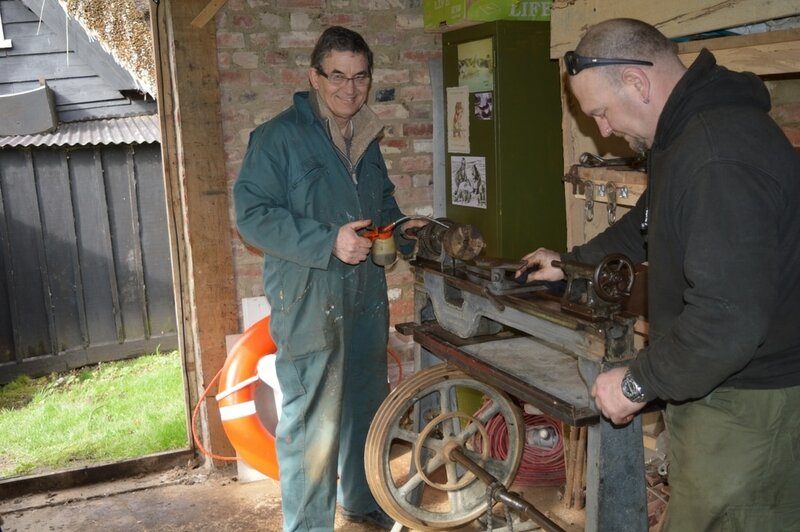 We were offered a treadle lathe showing what lathes were like at the turn of the 19th/20th century. 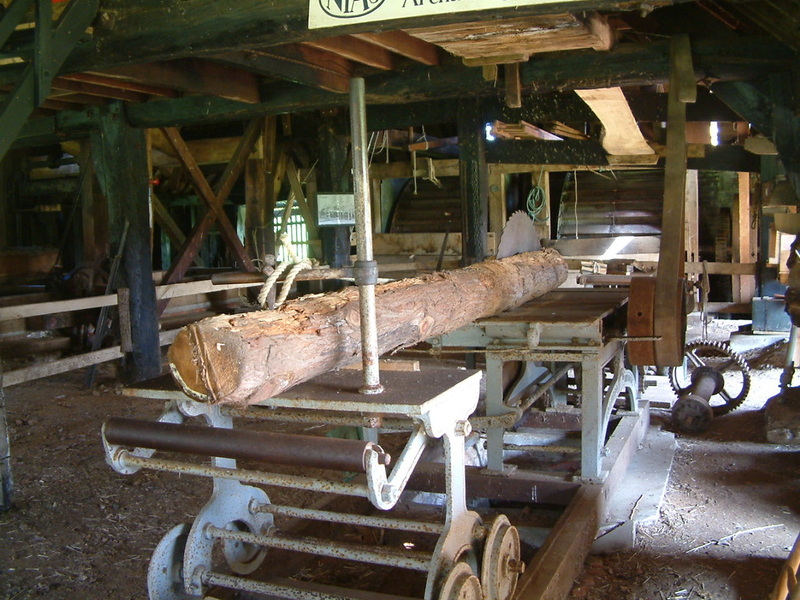 Whilst we are of course a woodworking historic site, we realised it was this kind of equipment employed in manufacturing parts for the mill. Being able to turn both metal and wood, and if it can be repaired also do screw cutting it would be a valuable exhibit being able to demonstrate both metal and wood turning. As with many such artefacts it came as a kit of parts which required the dirt and dust of a century removed to see what we actually had and the effort has proved well worth while. The Tool chest and Tools. 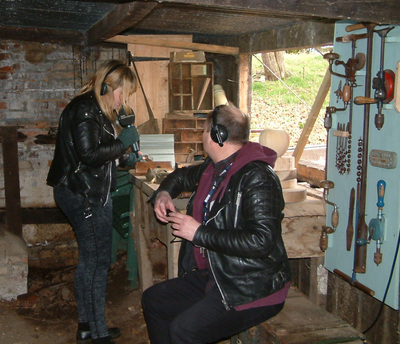 At the same time of obtaining the lathe we were offered a tool chest complete with cabinetmakers tools. We were very eager to accept this even though it meant a trip to London to fetch this artefact. Alas many decades of firstly use than storage had made the base of the chest rather less than perfect. Here is where the knowledge of Russell and Wendy came to the fore, judicious mending, cleaning and wood treatment soon had it an exhibit to be proud of. 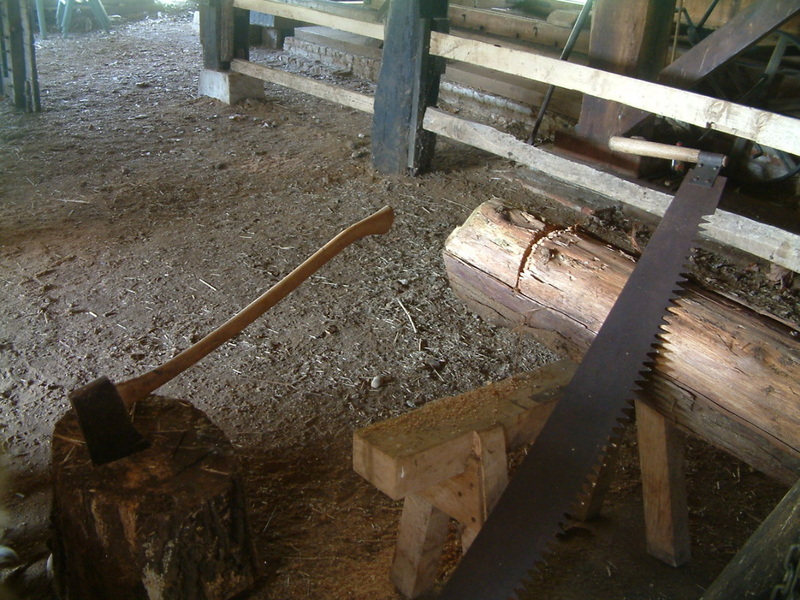 Unlike today not a power tool in sight a salutary lesson to the youngsters that not everything has to involve electricity. The exhibit makes it quite obvious muscle power and skill were the order of the day. With the end of January rapidly approaching came the realisation not long to go before we open again to the public which meant a rapid arranging of maintenance days. Somehow over the years the slope into the mill entrance seems to have got steeper and we must always be wary of those with limited mobility or confined to a wheelchair. With this in mind we set about altering the gradient is well as reducing the amount of trip hazards near the mill. Four volunteers set about this task was to set about harvesting the withies, a task that must be completed early in the year. Our hope is this year someone will come along and use the withies to give some kind of demonstration of hurdle or basket making. It was with something of a sigh of relief we closed for the Winter. After the initial problems with both the drive belts, now both replaced the saw ran like a dream. Our appearance on BBC2 was the precursor of the busiest day we had ever had, some visitors arriving an hour before opening time. Once again our visitors book bears witness to the public's enjoyment, many remarks as to how friendly we are. 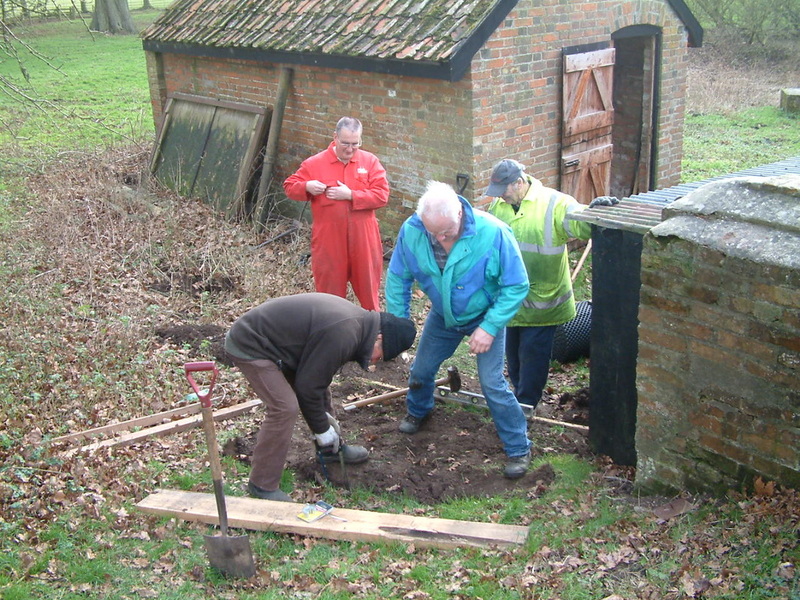 With more visitors it has now become urgent to attract more volunteers (please contact us if you would like to help). Once again we have had support from Basil and Dudley with their Stanley steam cars. Basil made the quip. " How long is it since I ran over a kid!" A little voice pipes up. "You can run over my sister if you want!" This brought forth much laughter from the visitors. We replaced one belt earlier this year and had hoped that the top one would survive the season alas it had other ideas. 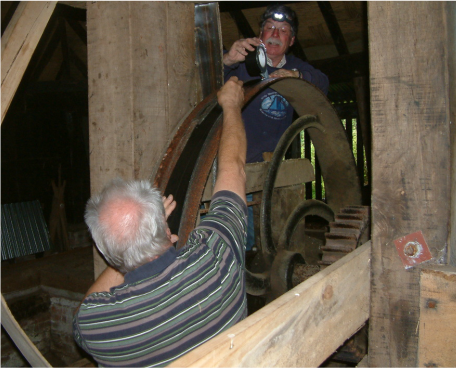 We had envisaged all kinds of problems so started early in the morning hoping we would be finished prior to the mill's opening. 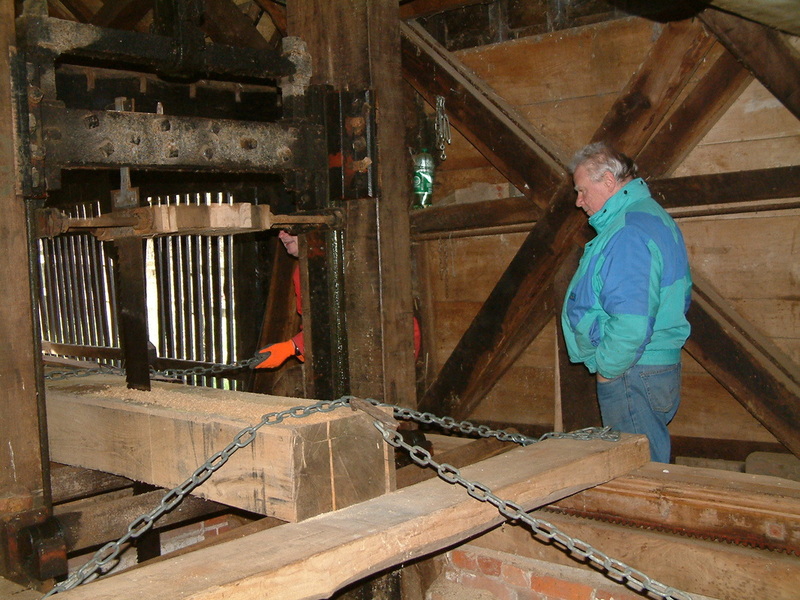 Everything went so smoothly that everything was ready way ahead of time and that day's visitors were none the wiser what had gone on that morning as with fingers crossed we got the mill under way. Three hours of perfect running later we wondered why we had worried. 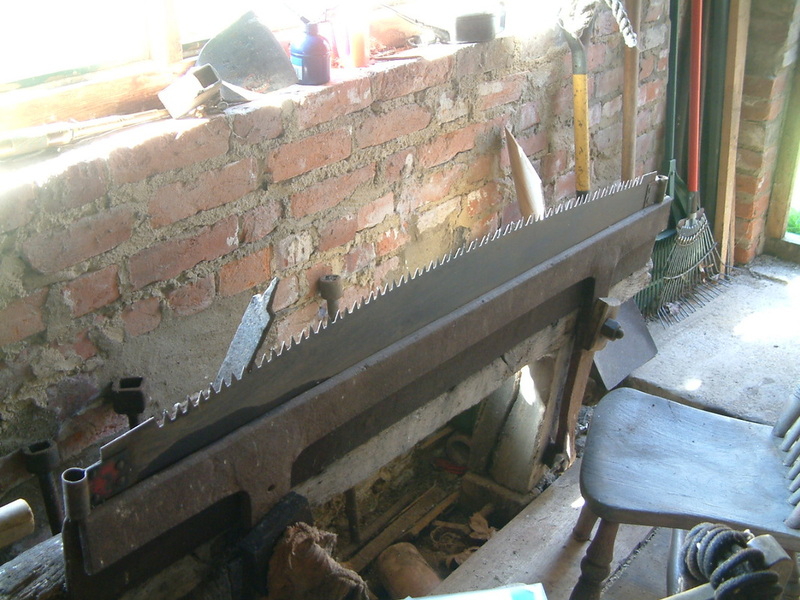 Some years ago an attempt was made to run with two blades in the saw, alas it was not a success. The catalyst for trying again was a proposed structure on the park requiring planks. 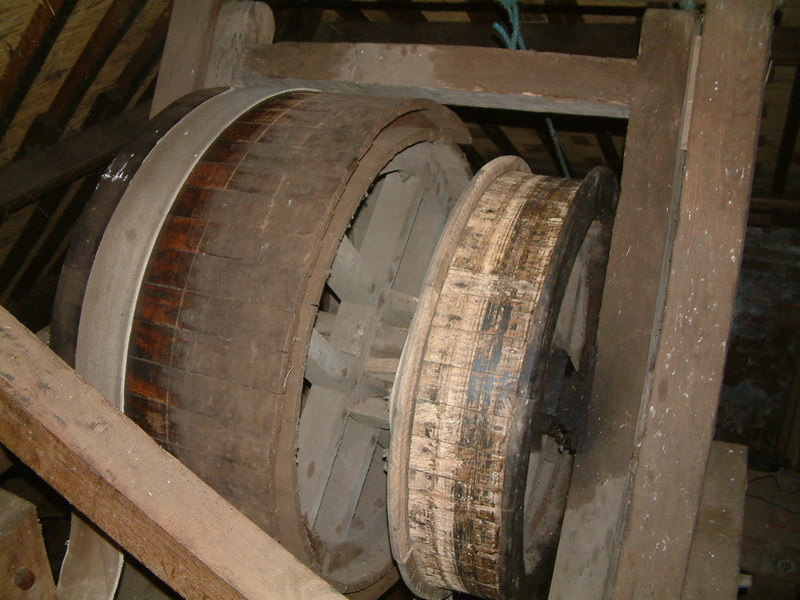 This time it was a success although a bit of fine tuning is still required and we must remember to dress the belts frequently with Stockholm tar as we are now asking a machine approaching 200 years old to suddenly do double the work. 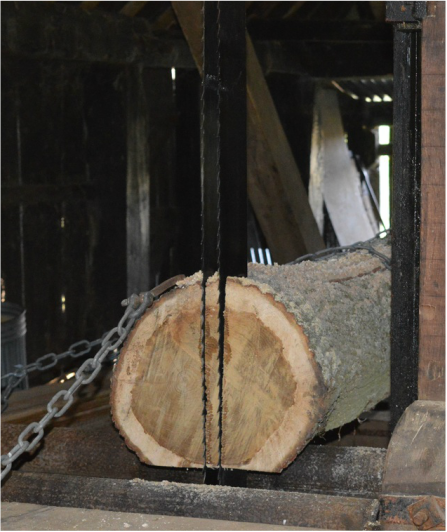 The project will certainly have green credentials, sawing done by waterpower of timber felled within a few hundred yards of the mill and used less than a mile distant. Not so much a case of food miles but timber miles! 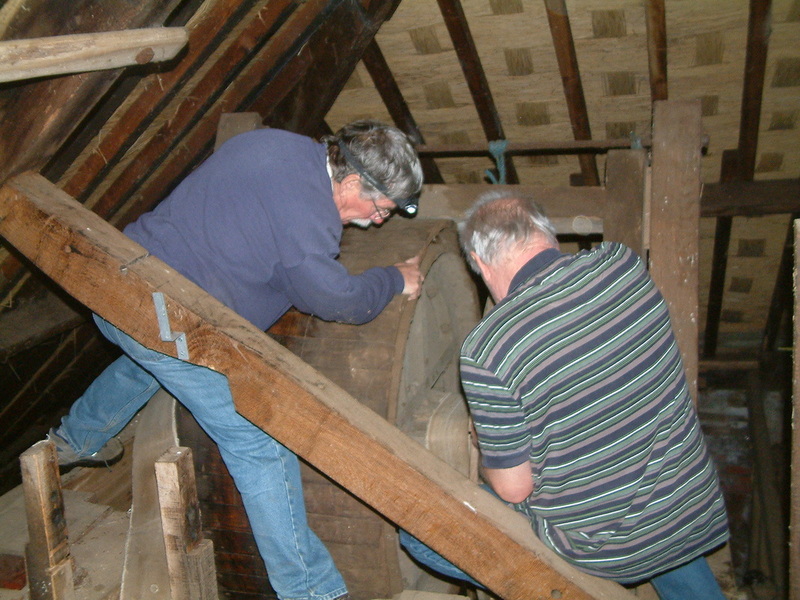 If all goes according to plan visitors to the mill should see us planking during the open days this season. Sawing Railway Sleepers for the Beeb. Lion Television visited the mill to do some filming in late January. 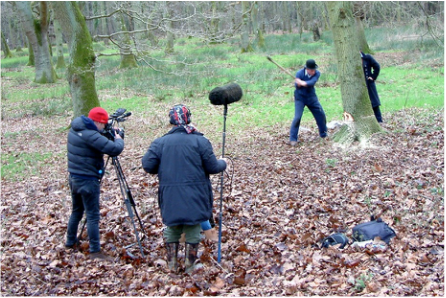 The program will appear on the BBC hopefully in the middle of this summer, the subject being railway building the presenters being Peter and Alex who have taken truly active roles in programs such as Victorian Farm and Edwardian Farm. 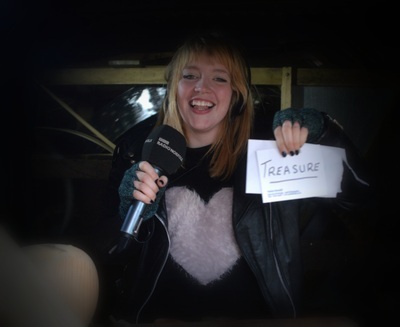 Both presenters and crew were truly taken aback by what this remote water-powered sawmill in the wilds of Norfolk had to offer being unable to understand why it hadn't come to the programme makers attention earlier. Truly all those taking part wished it had all been done later in the year when the weather would hopefully be much warmer. Something gives me the idea we will be having return visits for more filming later. Not only did they find us a willing and helpful bunch enabling them to get the best available shots from within the mill but there was the extra bonus of lunch provided. 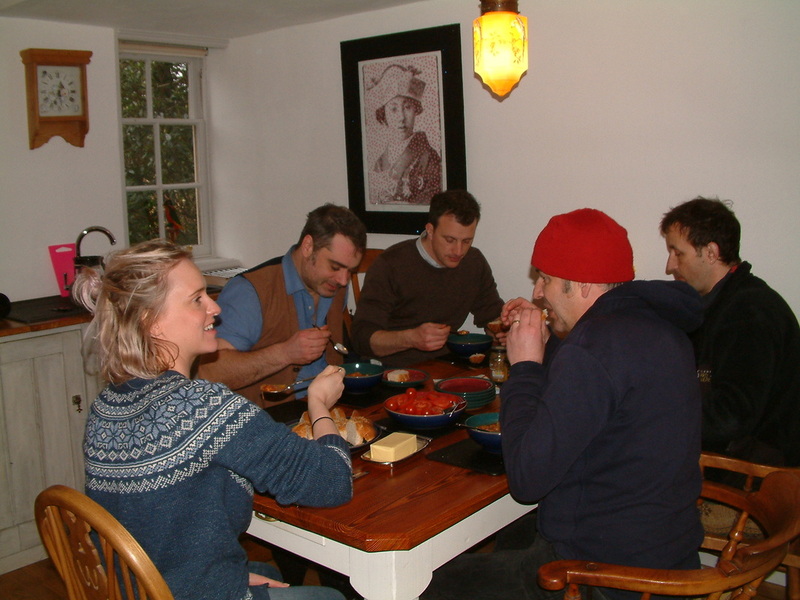 Hearty vegetable soup, home-made bread and venison pâté finished off with a good old Norfolk speciality short cakes. For screening dates keep an eye on the Facebook page. Harder work than Peter and Alex thought! We had fully intended to replace the main drive belt at the end of last year as the one in situ at that time had reached the end of its life. The firm who were supplying the belt arranged for it to be collected from their supplier and delivered to us the following day, unfortunately the courier turned up to collect it and promptly stated. "That's far too heavy I can't take that, it needs to go pallet freight." It's late arrival meant we had no time to fit it having to rely on a rather Heath Robinson repair to see the last opening of the season out. 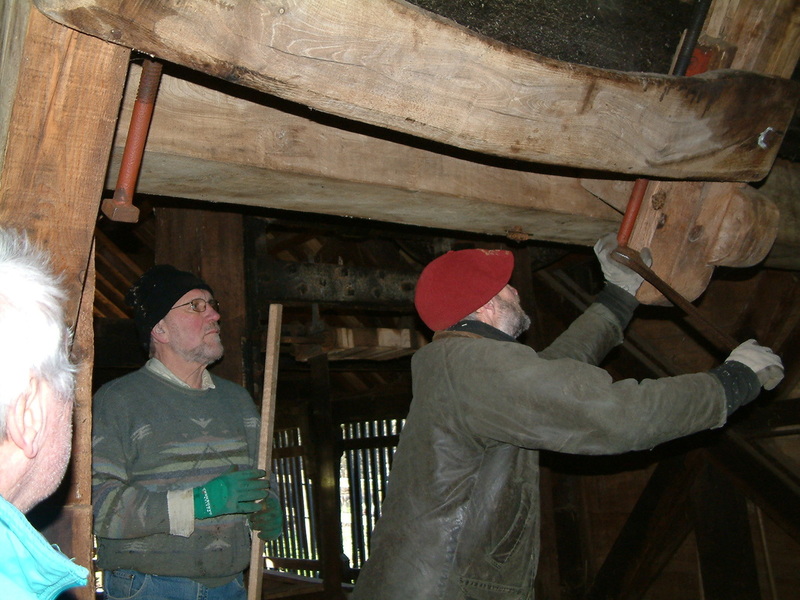 We had put replacing the belt until after Christmas but now this job has been done, thankfully the day whilst being a bitterly cold was still, as the watermill with its open sides is prone to through drafts which chill one to the bone. Teamwork had the old belt off and the new one cut to length, steel lace jointed, pulley wheels crowned and the new belt in position and tested within two hours. The proving test cut - success! 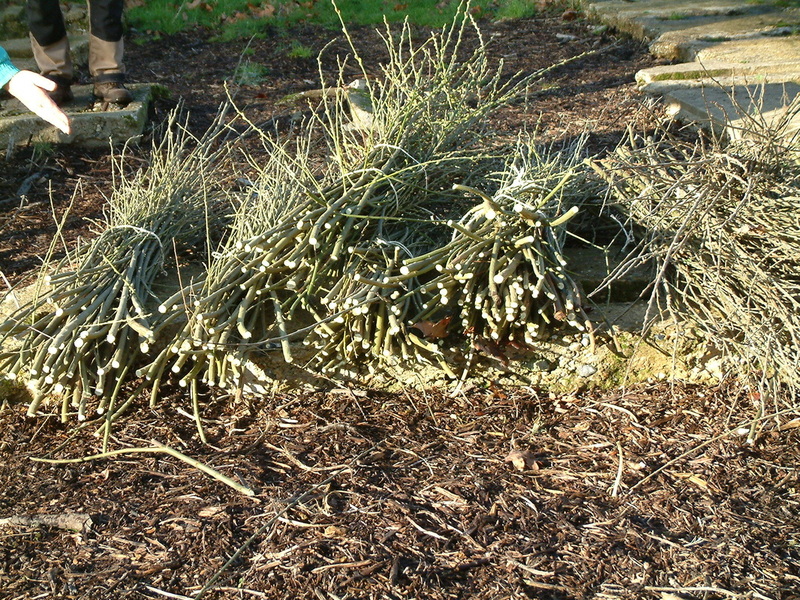 The unseasonal very mild winter and the consequent early new growth of plants suddenly made the harvesting of the withies from the withy bed we had renovated the previous year a time critical job if the first crop were to be usable. As to whether our efforts were timely will only become apparent when somebody tries to use this crop. 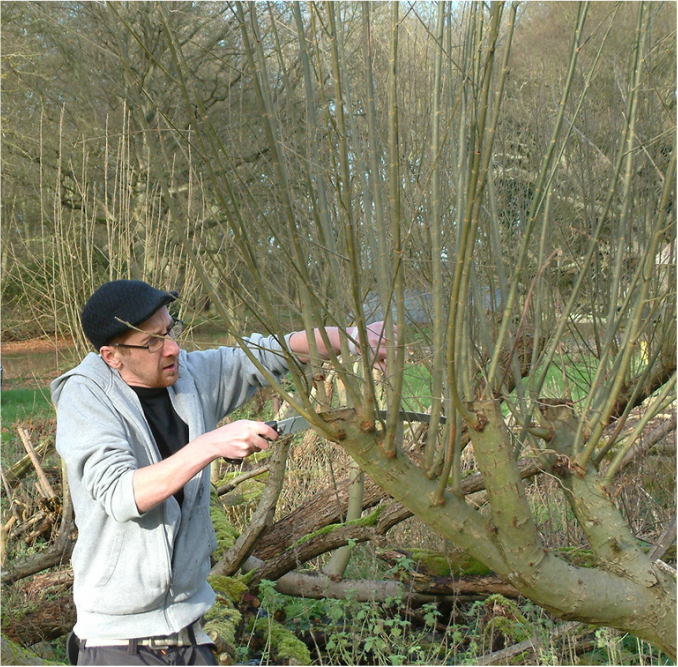 Unfortunately to date we have been unable to find anybody to come and demonstrate willow basket making as a demonstration on open days we've seen how ever to have come up with a self help answer. In March two of our volunteers are attending a day course on basket making and a third volunteer will be attending a course later on in the year. 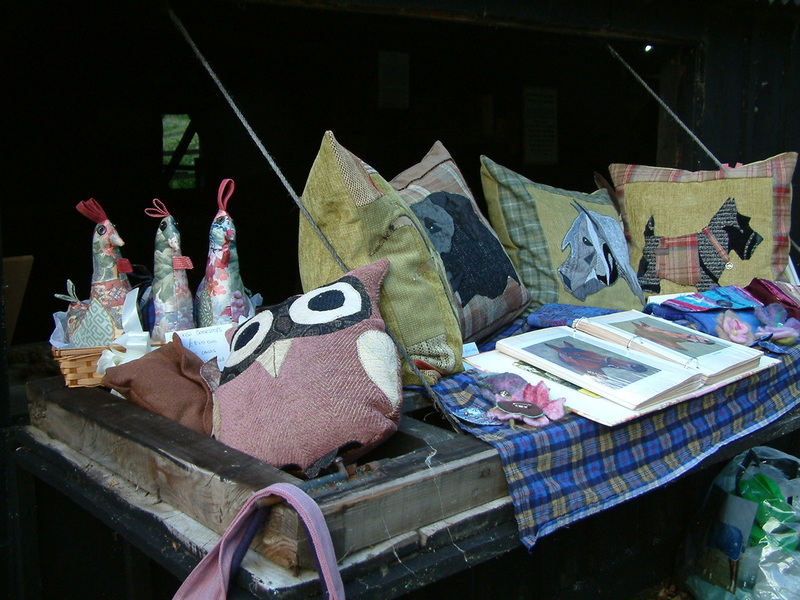 This is very much fulfils our ethos of keeping alive and demonstrating rural crafts and we would always welcome any craftsman who would like to come along and demonstrate their particular skills. All finished for the 2015 season. Thankfully the drive belt performed impeccably on the final day of the season but will be replaced during the winter maintenance programme. Once again the weather was kind to us and we were only a few visitors short of the record for a single day. We did have something of a shortage of volunteers but one of the steam car drivers took up the challenge to become a sawyer for the afternoon. Now whilst the men can drool over old machines for the ladies we had a local lady demonstrating her needlework skills causing plenty of interest. This balance is something we are trying to work on for next season. Problem with the drive belt. A new belt was already on order but we had a deadline to have the saw operational for a pre-booked group. It had to be a make do and mend repair and this took place on the Bank Holiday Monday ( IT RAINED IN TRUE BANK HOLS STYLE). 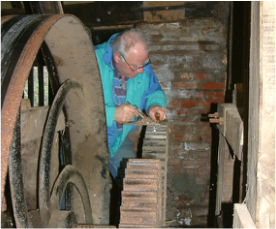 A small band of mill stalwarts set about solving the problem which turned out to be one of the original nails had worked loose and was tearing the belt. Now Gaffer tape is not historic in any way but it proved efficacious in solving the problem once the offending nail had been removed. There was certainly relief all round when the test saw the saw once again in operation. In August we had the added attraction of John Reeve a hobby walking-stick craftsman. The display was popular with the many visitors that day. 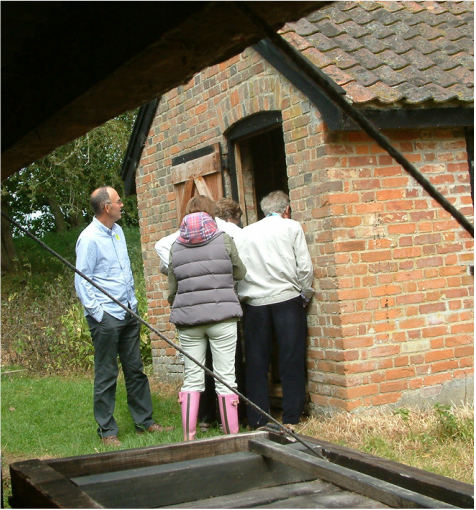 On a positive note John so enjoyed the atmosphere of the mill he has offered to attend on other open days - an offer we have gratefully accepted. Farewell to a prime mover in saving our mill. It was with sadness that several member of the volunteers attended the funeral of Mary Manning at her local church in Old Catton. Mary had been the prime mover in having realised the historic importance and getting something done about it! In Mary's usual dogged but persuasive way, she made people take notice of such an important historical site then in danger of being swept away. 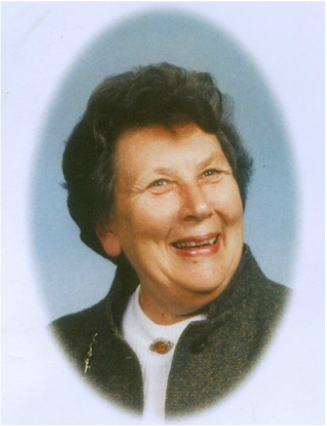 With the Norfolk Windmills Trust agreeing to be the responsible authority, Mary arranged a 999 year lease of the mill site with the then present owner Hon, Doris Harbord who unfortunately died before seeing the mill return to life. 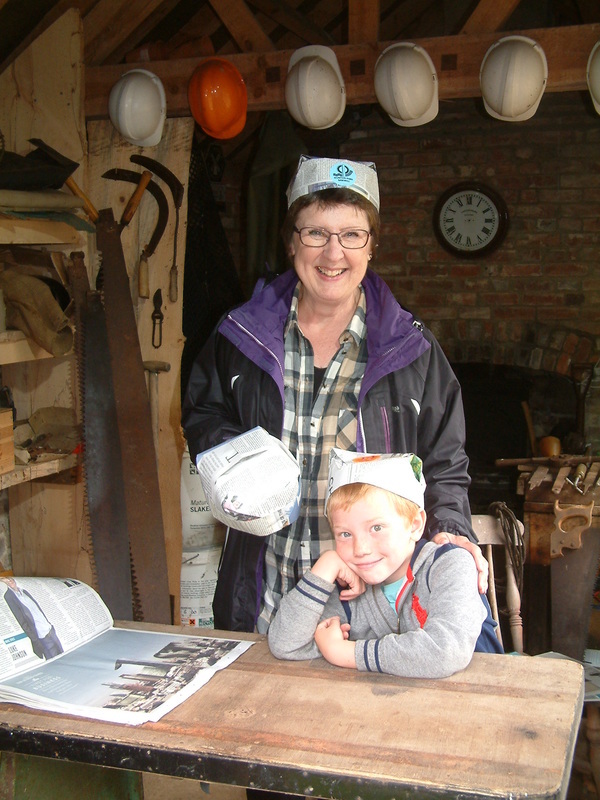 With failing health Mary's visits to the mill were few but she always remarked how happy she was to see it going from strength to strength and setting a benchmark for how it should be done. 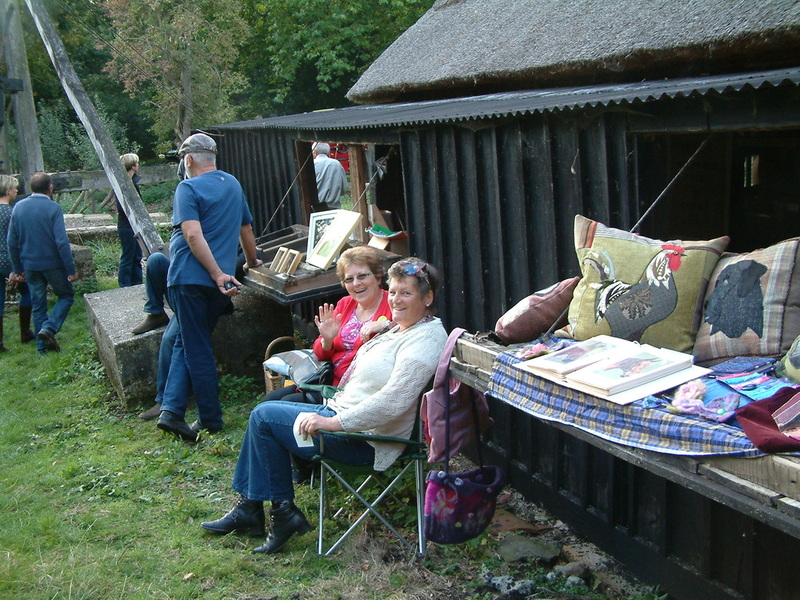 Visitors to the June open day had an opportunity to not only look at the 5 steam cars that were on show outside the mill but could for a donation go for a ride. Not a short up and down but a real trip out where they soon discovered steam cars are not sluggish, rather more a hang on to your hats folks experience. We will try and arrange for this treat for visitors on other open days that don't clash with the cars other rally commitments. If you wish to check if they will be there on a particular date just contact us via telephone, email, contacts form or see our Facebook page for up to the minute announcements. Carpenter or woodworkers paper hat. From the pages of an old book came the instructions how to make the said hat. Well Marilyn one of our lady volunteers was up for the challenge. Early efforts soon proved all newspapers were at that time broadsheets, tabloids only being useful if you have an exceptionally small head. Having perfected the way of folding to alter the size of the finished product Marilyn set to in the saw sharpening shed to demonstrate and caused a great deal of interest. 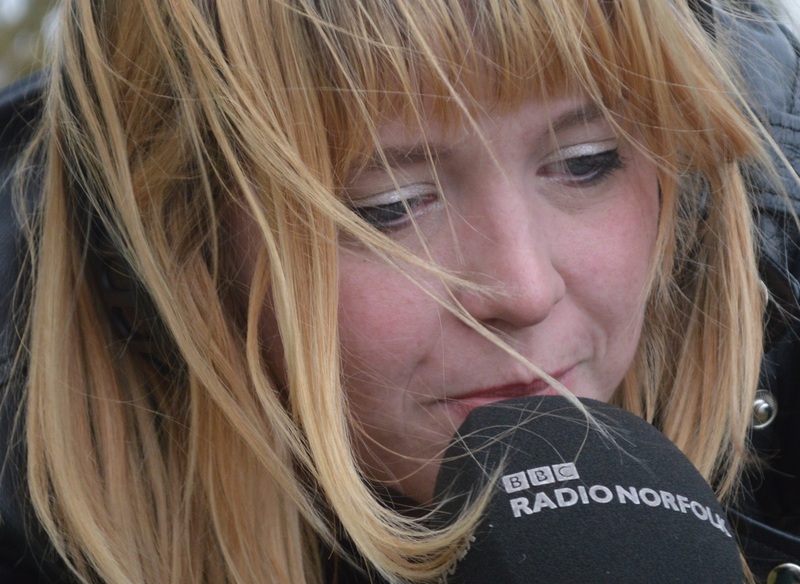 It all goes to reinforce our ethos "People like to see things happening." The queue to view might mean we need a rethink on where demonstrations of this sort should take place. 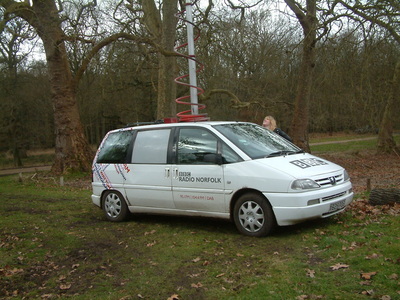 Radio Norfolk's Treasure Quest Visit. At the beginning of March the sawmill was the final destination of Treasure Quest. On the journey from the last clue in North Walsham, Sophie Little the reporter was rather taken aback that she was on her way to a breastshot waterwheel (it seemed her mind boggled what that meant). One of the locals who had been following, flagged Sophie and Ian (the driver) down and led them safely to the mill, with a good ten minutes to spare. Sophie had to find a plane that didn't fly under which the treasure was hidden and just to upset her, Ian carefully leant on it. 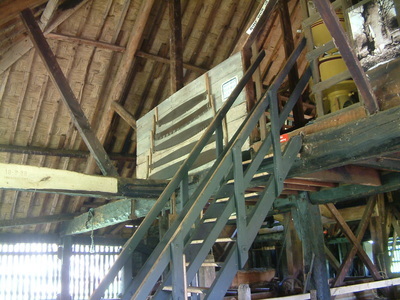 We truly received a worthwhile plug about the wonders of the mill and its setting. 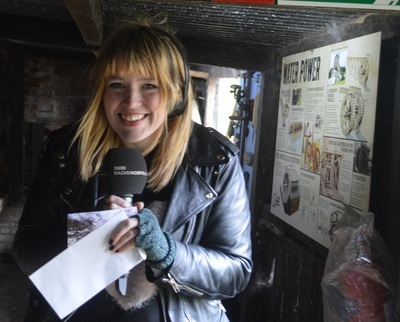 It then stirred memories from a listener who in the next program phoned in to say her great grandfather worked at the mill making five bar gates. Hopefully we will be able to contact her for more information. Changes ready for the 2015 season. 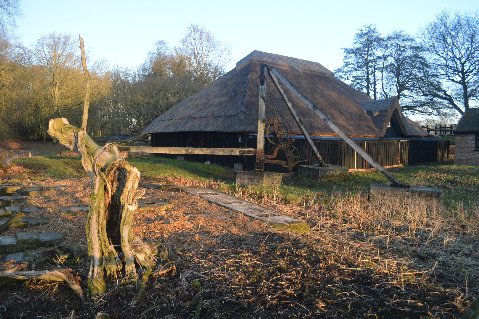 For 2015 we are once again making improvements to the mill. Hopefully by the first open day, the low voltage lighting will be operational, making it far easier for the public to study the various display boards and artefacts in the collection. The main circulating area will also be bathed in soft light which will not destroy the general impression of what life was like in the early days of the mill. To aid the understanding of the workings of the mill, various pieces of the machinery and gearing that would otherwise be hidden in shadow, will be illuminated. Outside the mill, steps are being constructed leading to the top of the dam giving visitors the choice of using these steps, or walking up the grass slope, to view the lake which provides the water. One is then able to understand the control mechanism of the sluice gates. 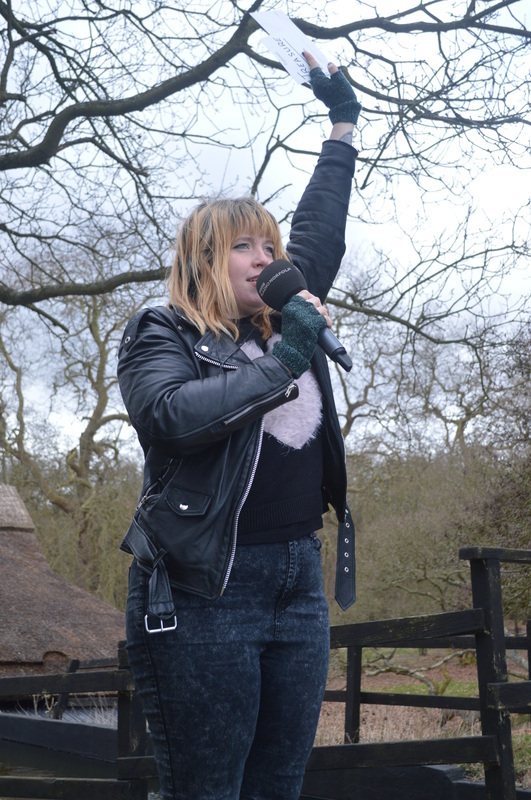 As an ongoing project, the area outside the mill will be covered with eco-friendly matting, maintaining the green aspect around the mill but providing better access to those in wheelchairs. Weather permitting, this will all be complete by the open day in April. With the blessing of the landowner, we have removed the unkempt greenery that had originally been a withy bed which had produced the raw materials for basket weaving. 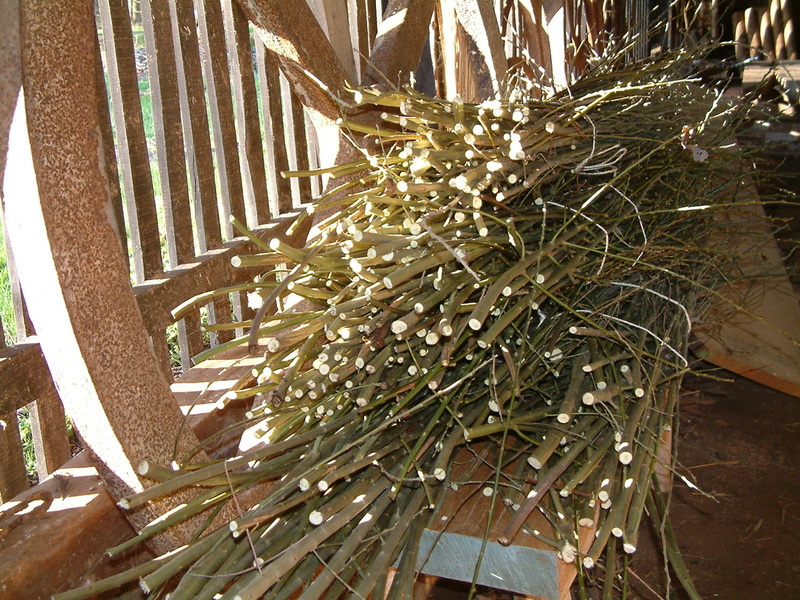 With these efforts, the withy bed will be brought back into production, so local basket weavers can make truly local willow woven articles. This work has revealed the foundations of the WW2 sawbenches which ran adjacent to the mill - powered we are told, by a portable steam engine. With the area clear it has opened up previously unobtainable views of the mill. Last open day of 2014 a great success. What we had expected to be something of a quiet day proved to be anything but. 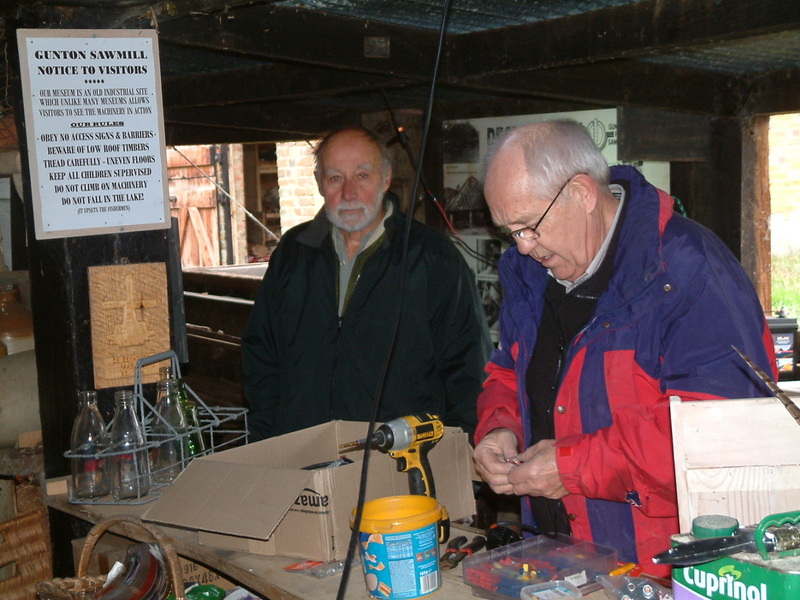 A visit by members of Wymondham U3A got the visitor numbers off to a flying start. Two of the early visitors turned up in their Austin A30 and were both surprised and delighted to suddenly become an exhibitors for the day with free entry. Not only did Basil turn up with friends in three Stanley steam cars but a local farmer turned up in in an all American Semi Trailer so we had a wide range of dates for road transport on show which the visitors all seemed to enjoy. Inside the mill there are now several new displays. Where possible tools are either those used on the Gunton Estate or representative of those which would have been in use over the years. 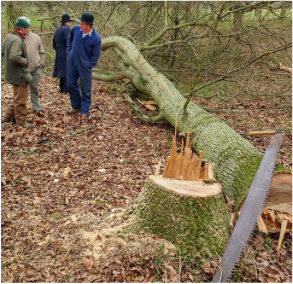 Although beyond repair at present due to several parts being missing the Holmes circular saw has had a log mounted on the bed to demonstrate how the saw would have been used. Please see the gallery below for a selection of the displays.